Audio at the top of the list? It is a phone. Hello? Wideband audio (HD voice) has been added because it extends the frequency range of audio signals transmitted, resulting in crisper word clarity and more natural sounding speech. Though 20 carriers will support it, none of the U.S. carriers will initially. It now has three microphones (instead of one) plus background noise reduction. There are now five magnet transducers in speaker (vs three) and redesigned earbuds (now called EarPods). Same 326 ppi as the iPhone 4S but taller Retina display. One more row of app icons. Better color saturation. More accurate color. Touch sensors are embedded in screen making for a thinner, clearer display. It's not just a phone. It's a smartphone. A digital assistant. We want speed and efficiency -- especially when being entertained. Apple says the A6 chip is up to 2 times faster than the A5 chip in the iPhone 4S. We plan to test that claim on September 21st. Finally! It has 4G LTE (up to 100Mbps, depending on carrier) Most 4G LTE phones have two chips -- one for voice, one for data. The iPhone 5 has one chip that does both. FYI, Verizon's 4G LTE coverage is in 7 times more cities than AT&T's 4G LTE coverage. It has 5GHz dual channel 802.11n support with download speeds of up to 120Mbps. Though similar in specs to the iPhone 4S camera, it has improved low light performance, spatial noise reduction, next generation image system processor, and even faster photo capture. And like the iPhone 4S, it has 1080p video but with improved image stabilization, face recognition, auto white balance, and improved noise reduction. Plus you can take still photos while recording video. The best FaceTime camera yet with 1.2MP still photos and 720p HD video. As with the iPhone 4S, you can do FaceTime on both WiFi and cellular networks. The main aluminum housing is machined to finer tolerances than ever before. The back cover is now made of anodized 6000 series aluminum -- the same material used on the MacBook Pro. Above and below the aluminum back piece is ceramic glass (on the white and silver model) and pigmented glass (on the black and slate model). 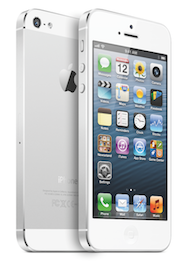 The iPhone 5 is 1.7mm (18%) thinner than the iPhone 4S and iPhone 4. It is 4.7mm (38%) thinner than the iPhone 3GS. The iPhone 5 is 28 grams (20%) lighter than the iPhone 4S, 25 grams (18%) lighter than the iPhone 4, and 23 grams (17%) lighter than the iPhone 3GS. The Lightning 8 pin digital connector replaces the 30 pin connector. It plugs in either way -- helpful when groping in the dark to plug your iPhone 5 into the charger. However, the new connector can present a challenge if you have a third party accessory that requires the old 30 pin connector. Though 8 pin to 30 pin adapters will be on sale in October, docking the iPhone 5 with legacy devices may not be practical or effective. Verizon iPhone users who want to keep their unlimited data plans don't get a discount on the iPhone 5. They will have to pay the full unsubsidized price. 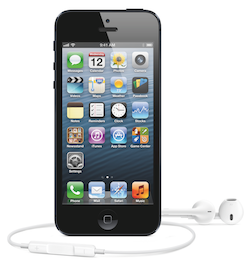 AT&T iPhone users with the unlimited data plan can qualify for an iPhone 5 discounted price but will be throttled down if they exceed 5GB of data. One other way AT&T using trying to wean you off of your unlimited data plan: If you choose to do cellular FaceTime, you lose the plan.